BYD Motors, the U.S.-based subsidiary of a China-based company that Long Beach Transit (LBT) staff recommended this past February 25 for its Electric Bus Project, is–according to multiple documents–not the company it claims itself to be. In addition, it appears that the company is not only lacking Altoona-approval–the federal U.S. standard for testing public transit buses, which presents a huge risk should LBT take on their buses–but has ultimately failed in establishing promised North American headquarters in Los Angeles and Windsor, Canada. Statements from Rolando Cruz, executive director and vice president at LBT’s Maintenance and Facilities division say that BYD plans to be producing buses in America by 2014, however, a presentation made to the LBT board stated that the transit authority hoped to have the project completed by June of 2014. This ultimately means that the entirety of the buses being offered by BYD will be composed of Chinese components, ultimately contradicting LBT’s electric bus grant, which has a Buy America clause stipulating that at least 60% of the bus components be made in the U.S. and the bus itself be assembled in the U.S.
On top of all this, it has come to light that BYD provided incorrect information about their U.S. presence in their proposal to LBT. 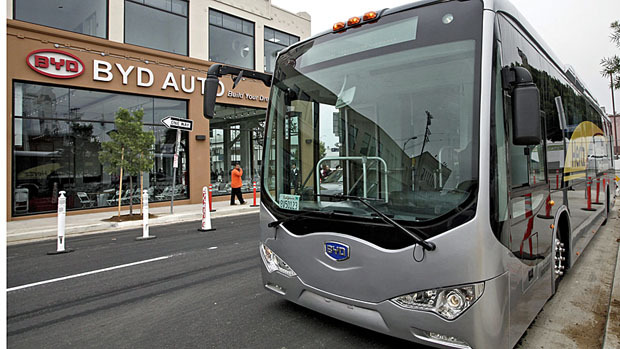 To test the performance of their buses, BYD held a trial run–not a buy-in–with Hertz in Los Angeles on December 23, 2012. The results of these trials as claimed BYD were that their electric bus produced a 155+ mile range while running at 1.66kWh/mi. Results obtained by the Post show that the trial actually produced a range of 123 miles with a 2.02 kWh/mi consumption rate–all with no heating or A/C, meaning that more than 90% of the battery would have to be used in order to achieve the results claimed by BYD. On a hot day with a full passenger load, the bus performance would actually result in about a 65 mile range at 3.8 kWh/mi. Estimated full-charge time for BYD buses is three to four hours. BYD Motors was chosen over South Carolina-based Proterra as transit staff’s recommendation for the recepient of the Department of Transportation’s Transit Investments for Greenhouse Gas and Energy Reduction (TIGGER) grant awarded to LBT two years ago. Proterra buses are in revenue service in multiple U.S. cities and have been Altoona tested since early last year. LBT’s Board is hosting a second study session today to obtain more information about the staff-recommended company and will be voting on the project at its March 25 meeting. The buses chosen will be deployed on pilot routes beginning with Downtown’s Passport, chosen due to its less-than-30-mile route, the capability of the route’s entire line being electric, and a convenient built-in 10 minute charging stop at the Queen Mary. Long Beach Transit Board Meeting will be held Monday, March 25 at 12PM at City Council Chambers, 333 W. Ocean.